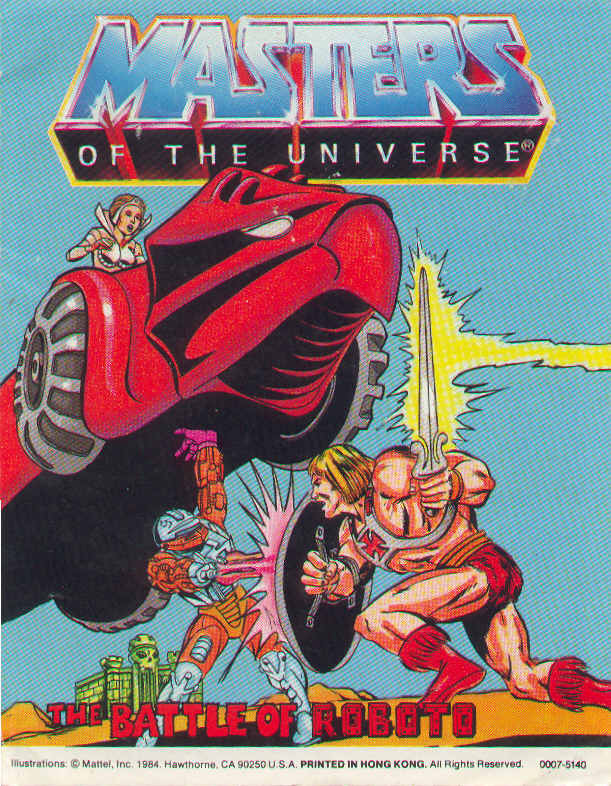 The Battle of Roboto is a 1984 Masters of the Universe mini-comic by Christy Marx, Larry Houston, and Michael Lee. Here, Skeletor commandeers Man-At-Arms’ newest invention and marches on Castle Grayskull with it. This is, on a certain level, Man-E-Faces all over again, but with different characters and vehicles. And yet it’s somehow more compelling; whereas Man-E-Faces was always pretty lame, Roboto is impressively overpowered, and we do get some nice drama and resolution here. All around, the art is pretty good, although Man-At-Arms’ eyebrows and mustache aren’t ever colored. All the characters are now in full Filmation style except the pink Sorceress. The only other nitpick is that “Grayskull” is misspelled again. In all, it’s a fun read, and the additional characters help the He-Man world feel a little more populated.